This post was originally published on November 25, 2010. But I thought it should come back. You see, today marks the 90th anniversary of the discover of insulin. 90 years ago today Doctors Banting and Best were successfully able to isolate insulin for the first time. And in doing, saved countless lives. Yesterday, I wrote about many of the diabetes blessings that I am thankful for. 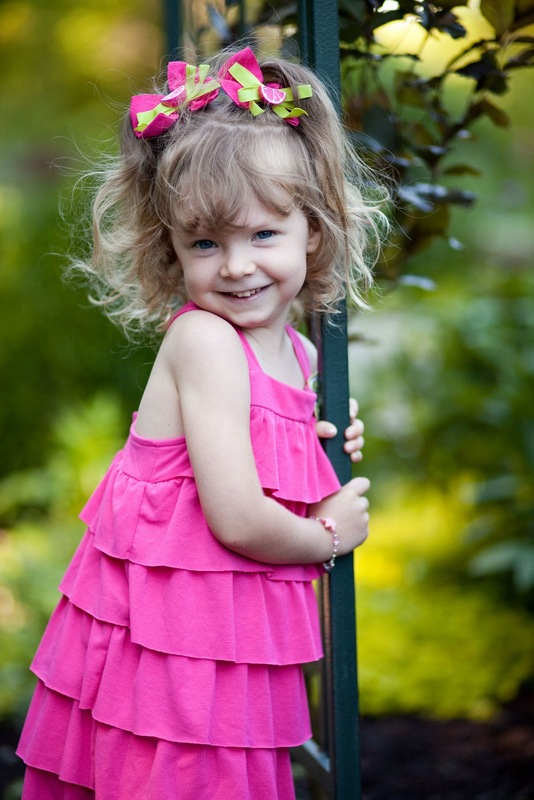 I was going to write more today about about how thankful I am for my wonderful hubby and darling little girl. And I AM so VERY thankful for them! But I write about them a lot. So today I'm going to tell you about Fred. A man I have never met. A man I am so incredibly thankful for. I man who holds a special place in my heart. Why, Dr. Frederick Banting, of course! In October 1920 in Toronto, Canada, Dr. Frederick Banting, an unknown surgeon with a bachelor's degree in medicine, had the idea that the pancreatic digestive juices could be harmful to the secretion of the pancreas produced by the islets of Langerhans. Early in 1921, Banting took his idea to Professor John Macleod at the University of Toronto, who was a leading figure in the study of diabetes in Canada. Macleod didn't think much of Banting's theories. Despite this, Banting managed to convince him that his idea was worth trying. Macleod gave Banting a laboratory with a minimum of equipment and ten dogs. Banting also got an assistant, a medical student by the name of Charles Best. The experiment was set to start in the summer of 1921. After a while, they removed the pancreas, sliced it up, and froze the pieces in a mixture of water and salts. When the pieces were half frozen, they were ground up and filtered. The isolated substance was named "isletin." Banting's and Best's laboratory, where insulin was discovered. The new results convinced Macleod that they were onto something big. He gave them more funds and moved them to a better laboratory with proper working conditions. He also suggested they should call their extract "insulin." Now, the work proceeded rapidly. The team was eager to start testing on humans. But on whom should they test? Banting and Best began by injecting themselves with the extract. They felt weak and dizzy, but they were not harmed. Collip continued his work to purify the insulin. He also experimented with trying to find the correct dosage. He learned how to diminish the effect of an insulin overdose with glucose in different forms. He discovered that the glucose should be as pure as possible. Orange juice and honey are good examples of foods rich in glucose. In January 1922 in Toronto, Canada, a 14-year-old boy, Leonard Thompson, was chosen as the first person with diabetes to receive insulin. The test was a success. Leonard, who before the insulin shots was near death, rapidly regained his strength and appetite. The team now expanded their testing to other volunteer diabetics, who reacted just as positively as Leonard to the insulin extract. Amazing, isn't it? What if he had given up? What if the criticism he got kept him from pursuing his theories? Do you know what "life" was like before insulin? Before the discovery of insulin, a diabetes dx meant eventual coma and certain death. A person with diabetes had a lifespan of only one month to two years. Doctors eventually found that a near-starvation diet of a few hundred calories per day helped to extend some patients' lives by a year or two. Most patients were severely malnourished and very few weighed much more than 70 pounds towards the end of their illness. In his book, The Discovery of Insulin, Michael Bliss describes the painful wasting death of many people with diabetes before insulin: "Food and drink no longer mattered, often could not be taken. A restless drowsiness shaded into semi-consciousness. As the lungs heaved desperately to expel carbonic acid (as carbon dioxide), the dying diabetic took huge gasps of air to try to increase his capacity. 'Air hunger' the doctors called it, and the whole process was sometimes described as 'internal suffocation.' The gasping and sighing and sweet smell lingered on as the unconsciousness became a deep diabetic coma. At that point the family could make its arrangements with the undertaker, for within a few hours death would end the suffering." Diabetes doesn't seem so silent or innocuous when you know what happens. Do you wonder, like I do, "How much time did we have left? What if I hadn't pressed for that blood test? What if we had waited? What if I had ignored it longer...?" The discovery of insulin was one of the most revolutionary moments in medicine. Though it took some time to work out proper dosages and to develop manufacturing processes to make enough insulin of consistent strength and purity, the introduction of insulin seemed literally like a miracle. One year the disease was an automatic death sentence; the next, people -- even children -- had hopes of living full and productive lives even with the disease. Estimates show there are more than 15 million diabetics living today who would have died at an early age without insulin. One of those 15 million diabetics is my child. I can't even begin to tell you how grateful I am to those doctors. How glad I am that they didn't give up. Heidi over at A Work in Progress said that Dr. Banting would be one of the first people she looked for in Heaven. I agree. But I have a feeling there will be a long line to say "Thank You". 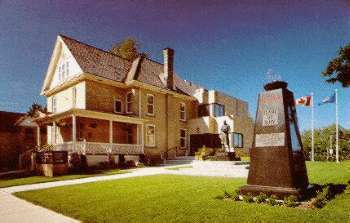 The Banting House still stands today in London, Ontario, Canada. 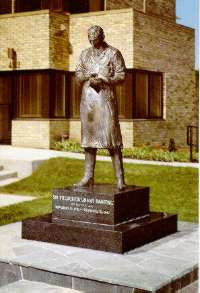 It features a statue of statue of Sir Frederick Banting and the Flame of Hope. This symbol of hope burns for all those with diabetes that a cure will soon be found. It is also recognized as a tribute to Dr. Banting’s unrelenting pursuit of insulin; to the lives already lost to the disease; and to the continuing perseverance of those who live with diabetes today. While the Flame of Hope is a symbol of hope, it is also a reminder that insulin is only a control for diabetes, not a cure. Only when that cure is at last found, will the Flame of Hope be extinguished. I don't know about you, but I plan on being there when that flame is extinguished. Loved all the history! Thank you! I am obviously very greatful as well!